There is a long history of migrants coming to Canada to escape repressive conditions in their homelands. In the 1960s, a different type of migrant was set to arrive in Canada: migrants who had come to work. Canada was facing a shortage of skilled workers and it needed a way to recruit people to come to work in the country. 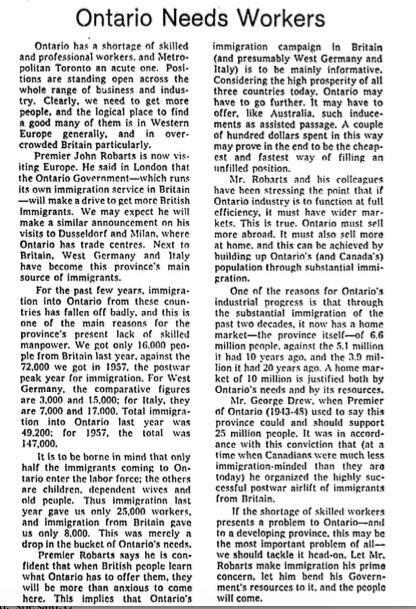 In the article below, (published in a June 1964 edition of the Globe and Mail), the author expresses provincial concern for the lack of workers in the labour force that the current immigration policy working to supplement the population can not solve. This sentiment is echoed across Canada, particularly in the prairies where the labour intensive farming industry is experiencing the shortage of workers. It is here that we can see the building blocks of a movement towards a policy alternative to immigration that would be able to meet the needs of the labour force.